When people think about our nation's great naturalists they often mention the likes of John Muir and Audubon. In Southeastern Ohio, however, you'll just as often find yourself talking about the life and times of Ora E. Anderson. Sometimes referred to as "The Thoreau of the Appalachian Woods", this amazing man spent his life roaming and working to restore our beautiful Ohio hills. A new book and DVD set chronicle the life and writings of Ora like never before and are set for release this November. Ora E. Anderson: The Soul of the Woods is a packaged DVD and booklet of Anderson's writings that trace the growth of the conservation movement in Ohio. Anderson was a participant in and an eyewitness to that movement as a young newspaper editor in Jackson, Ohio. He covered the Civilian Conservation Corps efforts in the 1930s to remake worn out farmland into the Wayne National Forest and later, as a landowner himself, he restored his own Athens County farm. For him, it was a lifelong passion. The Soul of the Woods is produced by Jean Andrews and Steve Fetsch of Ohio Landscape Productions. Their 2005 documentary about Anderson, A Forest Returns, won nine different awards. This new project, a DVD and illustrated booklet of prose, captures Anderson's love of nature and his thoughts on the subject. "There are some people who do more than live on the land. There are some who shape it, mold it to conform to some ideal in their minds." "Ora Anderson," says naturalist Julie Zickefoose in her introduction to the booklet of prose, "preferred woodcocks to lawnmowers. He liked water and marsh; he liked edges and coves and small private nooks; he liked vistas and forests and the smell of sassafras leaves. And what he liked, he created. He was an artist of habitats, a planter of trees, a maker of places for the winged and scaled, the jointed and furred." In the video, Anderson walks his farm and talks about the changes he has seen over the past 50 years, following the evolution from farmland, to a young woodland, to a mature forest. Throughout the video quotes from Anderson's writings on conservation, watercolors by artist Barbara Sheriff Kostohryz, and music by Bruce Dalzell punctuate the story of the conservation movement with moments of grace and beauty. "Where would be we be without forests?" Anderson asks. This film reminds us of the role that nature plays - or should play, in our lives. "Ora Anderson had the soul of a poet. But his poetry was not merely in his writing, it was in every piece of wood he carved, every parcel of land he saved and nurtured, and in every person whose life he touched," says Bill Thompson III, editor of Bird Watcher's Digest. "While we no longer have Ora to talk to, to walk beside, and to laugh with, we still have his incredible vision, his remarkable life story, and his boundless joy for nature. All of these wonderful things are included in "The Soul of the Woods." 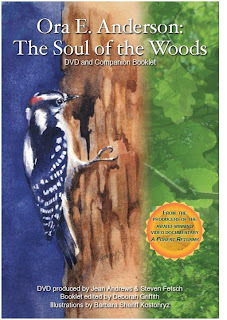 The Soul of the Woods DVD and illustrated booklet of prose will go on sale November 21st. All proceeds from the sale go to the Ora E Anderson Conservation Fund for Appalachian Ohio. To order a copy online visit Ohio Landscape Productions website: http://www.ohiolandscape.org/09Soul.html. Thank you for posting the news about our new video! The DVD will be screened on Friday, November 20th 8-9PM at The Dairy Barn Arts Center in Athens, Ohio. The event is free and open to the public. Bring a friend! By the way, we'll have copies of the DVD for sale, for people looking for a unique gift for someone special.